NewAssistant “OS architecture” for the network tree. NewDeployment-related setting “Logged in user not required” in Software passport. NewTimestamps for desktop and deployment log messages. NewAbility to add a batch file as consisting of more than one file. ImprovedNetwork storage assistants now displayed in the order they have been added in. ImprovedAssistants “OS” and “Online status” now accept multiple conditions. ImprovedRecording of macros using the service is performed in an environment more similar to one used during playback on remote machines. This eliminates certain differences in installer steps and fixes possible errors when running the installer. FixedDisappearance of the list of recently opened storages. FixedState of nodes in storage trees (expanded/collapsed) not being saved in certain cases. FixedIncorrect behavior of the addon installer process during macro recording if the previous installer includes controls that are incompatible with the Macro method. FixedBatch file started incorrectly when performing a Test run or recording a macro or sysshot if the storage is located on a shared resource. FixedUnexpected error during deployment if the preceding program was deployed using the macro method. Now, let’s focus on the main features. All released versions of PowerShell are supported. You can deploy parameterized scripts using the Silent method. When the script is being deployed, the PowerShell prompt may display error messages or other information. 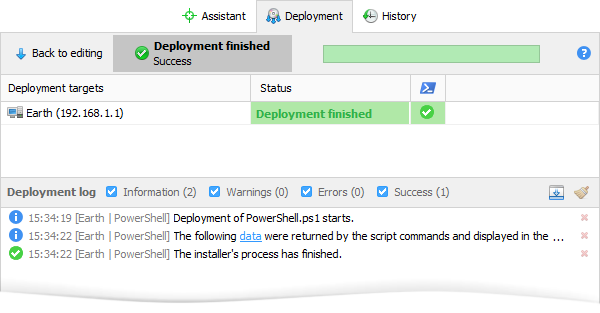 TSD collects all the script output, and you can view it via a link provided both in the deployment log and in Software deployment history. This way, you will always be informed about the events that occur during deployment! One of the most anticipated features has been the ability to deploy software to computers where the user is not logged in. At last, you can use TSD to execute the full range of deployment tasks on remote servers in your network: to install necessary software, to run a batch file or a PowerShell script. Now it’s more convenient than ever before. But be aware that certain programs may require the user session to be active during installation. Otherwise, errors may occur in their further operation. In addition, the network storage assistants have been slightly updated, and a new one, OS Architecture, was added. Now you’ll be just one click away from filtering your computers by system bitness. Assistants Online status and Operating system received a necessary little upgrade. Now several conditions can be selected at the same time: tick whichever Windows versions you’re interested in, add the online status filter, and choose architecture as a finishing touch. The result will be exactly what you’re looking for! That’s it for today. Are you looking forward to more news from our development team? Rumor has it, an update for Total Network Monitor 2 is imminent. See you soon. TSD 1.2.1: Total Software Deployment goes Multilingual! Spanish, Italian, German, French, Portuguese, Russian. In another wonderful news, our English documentation received many updates regarding recent new features. NewLinks from installer type descriptions for MS Office CtR, Batch File and Java Installer to relevant documentation sections. NewLinks from error messages in the Deployment log to recommendations for their solution. ImprovedSelecting nodes in the Software and Network trees. ImprovedOS name is now represented as an icon in the Deployment targets list. ImprovedStorage name instead of its folder name in the Network storage menu. ImprovedThe Deployment assistant no longer performs searches in installation dates in order to avoid displaying inaccurate search results when program version number partially matches the date. FixedError when creating the command file, which consequently made it impossible to load it. FixedFreezing when deploying to a computer where the user is not logged in. FixedUnaltered timeout values in Silent packages will now be updated after the default timeout setting is changed in Options. FixedRendering errors when editing search strings in the Deployment assistant. FixedMacro deployment of MSI installers will now be blocked when interactive services are disabled on the target computer. The MSI interface cannot be rendered in such an environment, and the installer is closed with an error. FixedSome errors that may impede re-deployment to a computer after deployment failure. FixedScroll errors on several controls.